Eliza turned four back in May. May 27th to be exact. And this post has been gathering dust in the unpublished archives for weeks. It’s ’bout time I dug it out. I planned to post it the week the babies came. But as you can imagine, things got a little busy. Seven days before they were born she turned four. So now we can casually say, “Yes… we have five…FOUR and under. A cakewalk right? Okay, let’s talk cake. Below are a SLEW of pictures from Eliza’s birthday celebration. Our blog doubles as a sort of family journal and I just couldn’t hold back on the pictures from her party. I’m not sure who had more fun this year – me or the girls! “But I’m not going to miss myself” she replied. Eliza – you will always be my same Eliza, eternal in nature, no part of you taken away or lost – just changed, developed, as you pass through another stage. You will always be you. And it will all be as it should be. I only wish I was better at capturing this time together – when you are small, pure, seeping with innocence and love. So I can return to it when I want to. So I can handle this grain of time in the hourglass once more. The tiny sands of motherhood are precious, unscripted, undiluted. They feel of pleasure, wonder and awe. And I don’t want to miss a single one. You are a joyful blend of adventure and compassion Eliza. Our friend Nikki took you hiking this week and reported you were scrambling, rock-climbing, jumping, and playing in the water like a mountain woman! You’re definitely my girl! You adore your little brothers. They look at you with such affection when you talk to them. And your little sisters follow you around aware of your every move, heeding your instructions, wanting to be like you. I appreciate your help, your desires to be good, and your unsolicited expressions of love. At any given moment you will say my name. In prep for Eliza’s birthday I ordered a butterfly garden from Amazon (I have to thank my friend Saydi for the idea. I watched the progression on her blog and thought it was a great learning project for kids). Eliza LOVES Butterflies. So what could be better than the real thing? In the above picture she is feeding our butterflies. They drink from cut oranges and sugar water on fresh flowers. These are our caterpillars! We had five and all five (even the slow-poke) eventually hatched. They came in this little jar with their own food (the brown stuff) and for a week they simply ate, and ate, and ate. Just like The Very Hungry Caterpillar. Until they were colossal caterpillars! Then they spun their chrysalises (not the best picture – sorry!). I tried so hard to watch this happen, but it seemed to occur in seconds. One minute I noticed them hanging from the top of the jar. The next time I checked, a chrysalis had formed around them. I missed it every time! I also missed all five of their coming outs! I’d check them in the morning then an hour later, like magic, another butterfly had emerged. Seemed to happen so fast. Bright orange painted ladies. We kept them for a couple weeks, then let them go in the backyard (after the babies were born). Eliza named them all “Sparkle” “Rainbow” “Eliza” “Heart” or a combination of these words. (My Little Pony must have been her muse). On Eliza’s actual birthday we had a small party with grandparents. We gave all the girls butterfly wings in anticipation of Eliza’s party. Our darling Mickey from Virginia sent Eliza a package. Here is Eliza clutching the card to her chest! Mickey – the look on her face is all about her love for you!! Thank you! Voila! 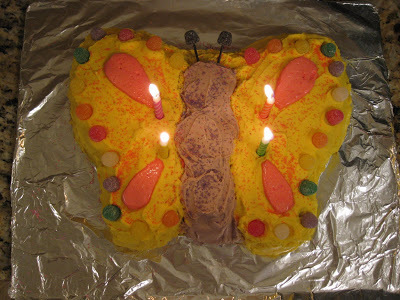 The much-anticipated Butterfly Cake! Eliza helped me put on the gumdrops. She was so excited about all the rainbow colors! Mmmm… Frosting. Eliza’s favorite part. Sami pulling faces! Such a tease! It’s Friday afternoon. The table is set and in a few minutes 10 little “butterflies” will flutter in. (The peonies are from our backyard). Eliza’s friends came with their favorite pair of butterfly wings on. We helped them make antennae with white headbands, twirled pipe cleaners and sparkly stickers. After completing their attire, we went outside for story time! Look at all those cute “blupperlies” (as Ali calls them) sitting on the picnic blankets. The “Momarch” Butterfly (me) read them Are You a Butterfly? by Judy Allen. The girls acted out the story with my instructions. We had them start out as caterpillars, then eat and eat and eat until they were stuffed. And then we had them eat some more. (It was all healthy – lettuce, oranges, apples, crackers). Total crack-up! The girls got so into it! Frenzied eating of everything they could get their hands on. Even the lettuce! I was laughing so hard! We kept encouraging them and they kept eating, until they really couldn’t eat any more! Abby, Emily, Lizzie, Emma, Eliza, Katherine. With tummies full we had them crouch down and form their chrysalises while we covered them with blankets (they giggled and thought this was so funny). Finally they burst out of the blankets and stretched their wings and flitted around like brand new butterflies. They loved the pretend-play. Then we stashed little butterflies of every color around the yard for the girls to capture with their own nets (great deal on createforless.com). Kind of like a treasure hunt. My helpers were Mom, Rachel, Deb! Wait! Deb – where are you? And Kara! I didn’t get a picture of you! I couldn’t have done it without you guys! Thanks! Then we played musical flowers (like musical chairs – except no one “got out” – we just kept hopping from flower to flower when the music was on. The girls took turns staying in the middle in lieu of being out. They were hot and sweaty after this game. So inside for presents. The “Birthday Girl” hat is from Auntie Kara and Katherine. Isn’t it fab? Then it was cake time. But rather than make another cake (phew!) I did cupcakes. I used your recipe Ang – always a hit. The girls loved the individual butterflies and flower suckers. “Happy Birthday Dear Eliza!” 1, 2, 3… Blow! Ali and Sami enjoying their cupcakes. Our final activity was the butterfly pinata. Eliza helped me stuff it with candy. This is Lizzie’s stash after the the pinata went down. Do you think she likes starbursts? Our cute neighbor Emma. I suspect she’s done the pinata thing before. She was going to town on it and knocked off one of the wings. She should go out for softball – she has an awesome swing! Eliza’s friends. Delaney, Katherine, Emily, Caroline, Eliza, Emma, Abby, Sami, Ali, her cousin Lizzie, and cousin Ty. The lone boy! But we’re so glad he came! It was Ty who finally took the pinata down. I guess we needed a little testosterone to do the job! The Garden Party was a success and we had a grand time! I love you Eliza. You are my sweetheart. “I love you more than all the rainbows in the world, more than all the twinkly stars in the sky, more than zebras, and even more than Red Vines.” And that’s saying a lot. Here’s to a spectacular fourth year and many more birthday parties. Your life is worth a thousand celebrations. Yep, explaining that you have five children four and under is MUCH better than explaining that you have five children three and under:)-not really. Looks like she had a wonderful 4th. Okay – you're right Cris. What's an extra year? It's less jaw-dropping to the average gawker. But in reality – it's pretty much the same intensity of labor. The biggest plus, however, is… that ONE of them is potty-trained! Thank goodness! A butterfly garden party! How wonderful. I love the decos, cupcakes and wings for the girls!!!! Absolutely beautiful Cath! And Eliza looks so happy. I'm totally stealing your idea for Ella's third birthday. Great idea. Everything looks so wonderful. We miss you so much!